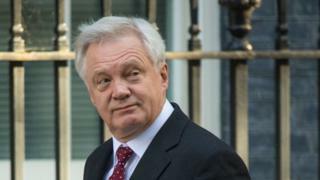 David Davis has sought to dampen Labour's expectations about a series of official reports on the impact of Brexit on Britain's economy. The government had sought to keep the 58 studies secret, saying they would undermine Brexit talks. Mr Davis was effectively forced into agreeing to their publication by a Labour motion in the House of Commons. But the Brexit secretary claims there has been a misunderstanding about what they contain. In a letter to Labour MP Hillary Benn, he said the analysis ranged from "very high level overarching" work to specific examinations "of certain product lines in specific sectors". But, he added, "it is not, nor has it ever been, a series of discrete impact assessments examining the quantitative impact of Brexit on these sectors". "Given the above, it will take my department - and other departments, since this work draws on inputs from across government - time to collate and bring together this information in a way that it accessible and informative for the committee," he added. He also argued that some sections should remain "private" because they contained "confidential or commercially sensitive information" or details that could damage Brexit talks because they had "been developed to underpin advice to ministers of the negotiation options in various scenarios". He said he would meet Mr Benn, the chairman of the Commons Brexit committee, on Monday to discuss what it would be in the public interest to release. But Commons speaker John Bercow has told the government it has 24 hours to publish the analyses or say why it hasn't. Responding to a point of order from Labour, following the publication of Mr Davis's letter, Mr Bercow said: "the motion passed on Wednesday obliges ministers to provide the Committee on Exiting the European Union with the impact assessments arising from sector analyses. "That should be done very promptly indeed. Failing that, I expect ministers to explain to the House, before we rise tomorrow (Tuesday) evening, why they have not provided them and when they propose to do so." Mr Bercow added that the Brexit secretary had contacted him to say that the government would provide the material before MPs begin a week-long recess on Tuesday. Speaking earlier at the Institute for Government in London, Mr Benn said: "I don't want to publish stuff about negotiating fall-backs, red lines. That would not be sensible." But he stressed that he wanted to see the material "as soon as possible", and that it would be for the committee to decide what information was made public.